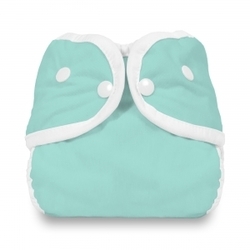 Thirsties Diaper Covers - Waterproof and Durable! Thirsties Diaper Covers are new and improved!! 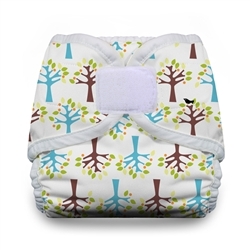 Previously sewn from a single layer of polyester laminate, Thirsties Diaper Covers now feature an additional layer of laminated fabric attached to the inside of the wings. What does this mean for you? 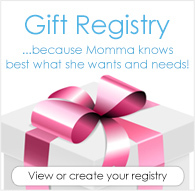 It means that these diaper covers are built with long-term duability in mind. The signature leg gussets offer a generous, but secure, fit over nearly any style of cloth diaper, including Thirsties Fab Fitted Diapers. 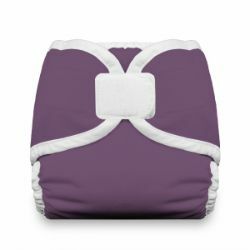 A comfotable diaper cover for chunky-thighed babies, Thirsties Diaper Covers have recently trimmed down their diaper covers 'just a smidgeon' to eliminate unnecessary bulk. 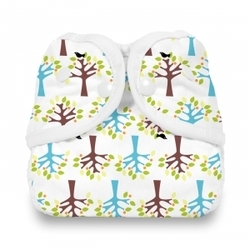 The biggest concern for cloth diapering parents, along with offering a leak-free environment, is for cloth diaper covers to be comfortable where they must grip baby - at the waist and thighs. 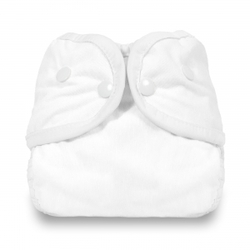 Thirsties Diaper Covers use a Lastin elastic that does not wear or stretch out with use; this elastic is wrapped in super soft bindings to protect baby's skin. The addition of leg gussets provide yet one more barrier of leak protection. 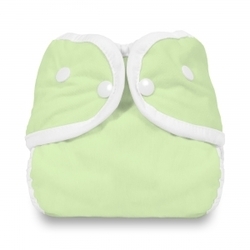 The smart construction of Thirsties Diaper Covers keeps moisture from wicking onto baby's clothes. Thirsties Diaper Covers offer a secure fit each and every time. If you are concerned about getting a secure fit on your hard-to-fit baby, the Thirsties Diaper Cover can do it. 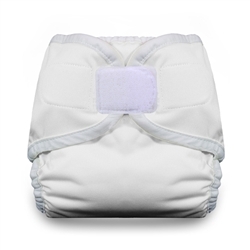 The Aplix velcro tabs can be snugged-up close or loosened at the waist and thighs to perfectly fit your baby's unique measurements. The new cross-over hook and loop tabs allow caregivers to choose which wing to fasten first. We aren't joking when we say it can fit any size baby - there's even an X-Small in the Thirsties Diaper Cover with an umbilical cord cut-out to protect that sensitive area while it heals. Don't worry about Aplix in the laundry - each diaper cover has fold-over laundry tabs sewn in to secure the tabs while washing. This keeps your diaper covers from tearing at fibers in other diaper covers and/or cloth diapers while being washed or dried. X-Small 6-12 lbs. 0-2 months 8"-14" 3"-7" 13"
Small 12-18 lbs. 1-5 months 10"-16" 4"-8" 15"
Medium 18-28 lbs. 4-24 months 13"-18" 6"-10" 18"
Large 28-40 lbs. 18-36 months 15"-20" 9"-12" 21"
*Weight and Age ranges are approximate so please check waist, thigh, and rise sizing as well! Thirsties is made in the USA; that's right. Buying Thirsties Diaper Covers means getting a great, comfortable fit for baby and supporting fair trade while you're at it. These are well-designed and well made. Lots of room for adjustment, even though they are “sized“. Only the rise is not adjustable, so this is not really such a big deal. Apparently these are a roomier cut than the duo or one size, So allow for more options underneath (we use flat diapers), which was why we went with these. I recommend paying attention to the thigh and waist measurements for each size, as these are more useful than the vague weight range estimates quoted. Made in the USA of quality materials is also a nice touch. The chart on this page says it fits 4 - 24 months, but the tag on the item says it starts at 9 months. They might want to update that. So therefore it's a bit bigger than I expected and my baby hasn't quite grown into it yet, but I wanted to go this route rather than the size 2 duo that fits up to 40 pounds. I use a large cover over a fitted for bedtime and it works great! No leaks! Now I just need a couple more! Love these diaper covers. They have great prints, great colors, and the fit is always great. Really like this cover! It's roomy enough to pair with large flats, but trim enough for simple prefolds! I love the cute blackbirds on the trees! Hook and loop is so easy to put on my squirmy 3 month old but doesn't snag my clothes like other velcro.